What’s not to love about an effective and truly organic face mask? Not only are organic masks little luxurious at-home spa treats, they are also powerful routine treatments for our skin. For example, using a gently formulated fruit enzyme and alpha hydroxy organic face mask a few times per week can work wonders for those with acne-prone skin and acne scarring. Mature skin types can get a boost of radiance from masks that contain ingredients which boost cell turnover and stimulate collagen production (like tamanu oil, avocado oil, and vitamin c). Even those with very dry skin can achieve glowing dewy skin by routinely using masks with ingredients like rose oil, fruit enzymes, aloe vera, and hyaluronic acid. Additionally, almost any skin type can benefit from a simple weekly clay mask that removes dead skin, kills acne-causing bacteria, unclogs pores, and reduces redness. The 20 organic masks on this list contain nothing from the list of “bad guy” ingredients (like parabens, phthalates, sulfates, petrochemicals, mineral oils, peg compounds, and ethoxylated ingredients) which are no good for your skin and have been linked to cancer. Instead, these organic masks will bathe your skin with essential fatty acids, vitamins, fruit enzymes, clays, and essential oils that work to nourish and renew the skin’s appearance from the inside out. Remember, just because an ingredient is organic and all-natural doesn’t mean that won’t irritate your skin. Each mask has been formulated to treat specific skin concerns (like dry skin, acne, wrinkles, scars, etc.) so be sure to read the tips for each mask and choose the best ones for your skin type. Happy masking! Need a little help selecting the best organic face masks for your specific skin needs? Then, check out The Ox Box! Each season, we’ll hand-select the best premium organic skin care products for your specific skin type and skin conditions. 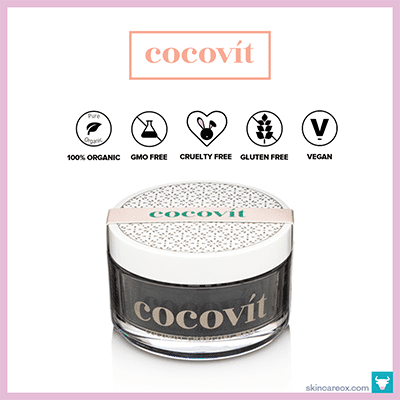 If you love coconut oil, then you’re going to adore Cocovit. Made from the highest quality raw organic coconut oil and other organic ingredients, this Ayurvedic mask is one the best non-toxic solutions for detoxifying the skin. Those with acne will love how the turmeric, neem, and activated charcoal work together to reduce redness, kill acne causing bacteria, and balance excess oils on the skin. At the same time, your skin receives essential fatty acids and collagen support (for anti-aging) from ingredients like coconut oil, ginseng, and geranium oil. To treat acne, mix 1 tsp of this powder mask with a detoxifying liquid (like yogurt, raw honey, apple cider vinegar, or chamomile tea) and rinse after 5 minutes. 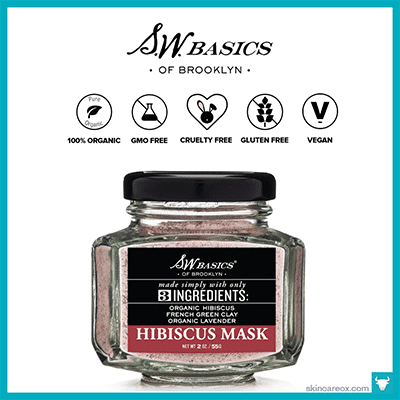 This delicious organic facial mask by S.W. Basics is made with organic hibiscus flower powder, organic lavender powder, and French green clay—that’s all. It’s a simple little mask that uses alpha-hydroxy acid (naturally occurring in hibiscus) to gently resurface skin and increase cell turnover. Just mix the powder with your favorite liquid (such as green tea, apple cider vinegar, or honey), apply the burgundy red mask to your face, and gently rinse once dry. You can get creative and create your own mask too. Try mixing 1 tsp organic aloe powder (reduces redness) + 1 tsp of organic matcha green tea powder (antioxidant) + 1 tablespoon of brewed chamomile tea (calming) with 1 tsp of this hibiscus mask. This organic mask is so intense (in a good way) that it warms when you mix it! The rich dark powder of raw cacao, activated bamboo charcoal, and red sea salt transforms into a heavenly mousse when water is added to the mix. Once this magic mousse touches your skin it starts absorbing excess oil, unclogging pores, and tightening skin all while the gentle warmth increases blood flow. It also includes a blend of turmeric, vitamin c, clays, salts, and essential oils which are effective enough to treat just about any skin condition. Ready to ditch your concealer? Well, maybe not yet—but this definitely is a must try beauty hack. These adorable eye masks are like a cup of delicious morning coffee for your eyes! 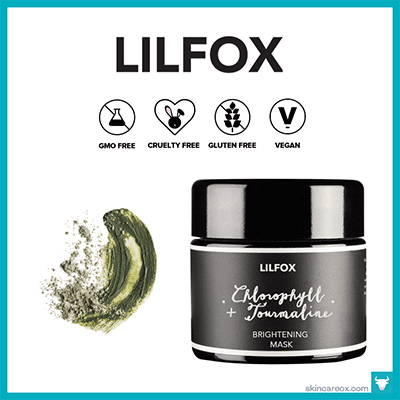 They are highly caffeinated and packed with ingredients (like organic matcha green tea, organic yerba mate, and organic green coffee) that will increase blood flow to the skin, decrease puffiness, and provide a boost of hydration to fight dark circles. Use this as a morning mask whenever you want to look well rested and refreshed. Also, try refrigerating them overnight for a cooling bonus. This gentle daily organic mask contains two very potent organic skincare oils worth checking out: carrot seed oil and calendula oil. Carrot seed oil has strong detoxifying properties and is great for troubled skin. Calendula oil is great at killing acne-causing bacteria, stimulating new skin growth, and reducing the appearance of dark spots. This exfoliating mask brings both of these oils together (along with lavender, oats, Bentonite clay, and rose petals) to remove dead skin cells, reduce inflammation, and tighten skin. It’s rare to find a mask that is so effective, but also gentle enough for daily use. Highly recommended for those generally problematic skin. What do Adriana Lima, Gisele Bundchen, and Halle Berry all have in common? They all credit their glowing, timeless complexions to daily use of vitamin C serums. That shouldn’t come as a surprise because vitamin C has been known to be a potent wrinkle busting, skin brightening, and sun damage reducing ingredient. 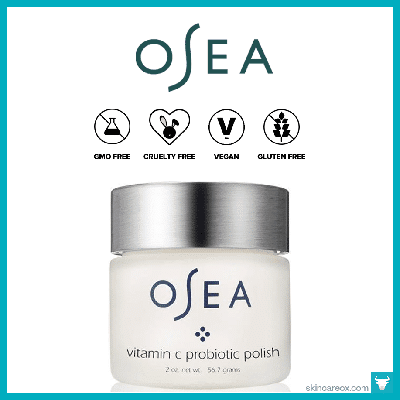 This Vitamin C Probiotic Face Polish is a vitamin C powerhouse. Filled with ascorbic acid (the first ingredient!) for brightening, seaweed for hydration, and vegan probiotics for inflammation, this exfoliant mask has the potential to instantly transform your skin. This is truly a great all-around hydration organic mask. It boasts powerful antioxidant, anti-inflammatory, and hydrating ingredients (such as calendula oil, olive oil, hyaluronic acid, and lavender). These ingredients work together to make your skin look dramatically healthier. This organic mask includes hyaluronic acid to help your skin retain its hydrated state throughout the day. Simply apply to your face, neck, and hands after cleansing (or exfoliating for deeper penetration) and leave on for 10-20 minutes to achieve dewy, moisturized, and firm skin. Everyone is raving about this Tata Harper face mask. The Resurfacing Mask has been praised by countless magazines, customers, beauty bloggers and professional aestheticians as being a mask that can delivers results. With a combination of beta-hydroxy acids, probiotics, and soothing aloe vera, this mask instantly smooths skin, reduces pore size, and brightens skin tone. It delivers all of the benefits of a traditional peel treatment without risking major irritation/redness. Like most BHA/AHA masks, start by using it every day for 2-3 days and then reduce usage to 1-2 times/week. 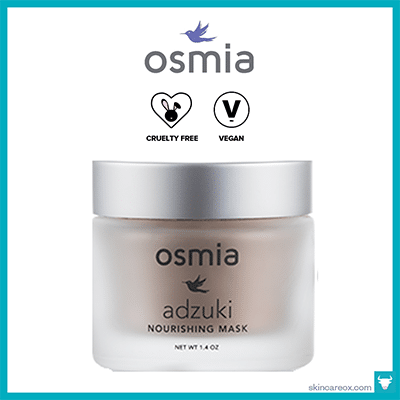 If you’ve read our article on luxury organic skincare, then you already know all about this great organic mask. 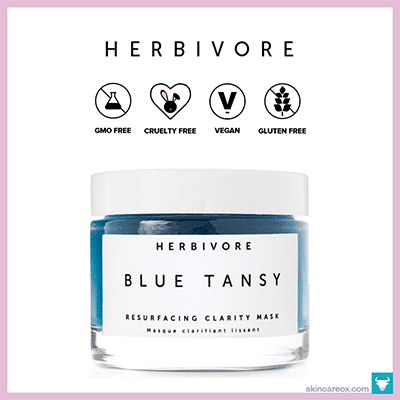 A fantastic treatment for acne prone skin (and acne scars), this mask combines ingredients like blue-tansy (anti-inflammatory) with white willow bark (natural BHA: beta hydroxy acids and salicylic acid), fruit enzymes (high in AHA: alpha hydroxyl acid), and aloe leaf to exfoliate, smooth, and resurface your skin. This mask is milder than a typical AHA + BHA peel, but sensitive skin types may still experience mild tingling sensations. 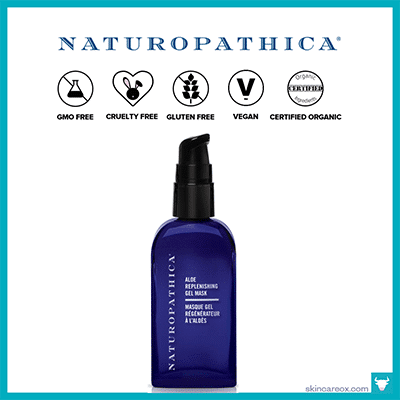 The blue tansy oil and aloe leaf will help to counteract irritation that may occur from the AHA exfoliation. This gel mask is an absolutely miracle for dry skin types. 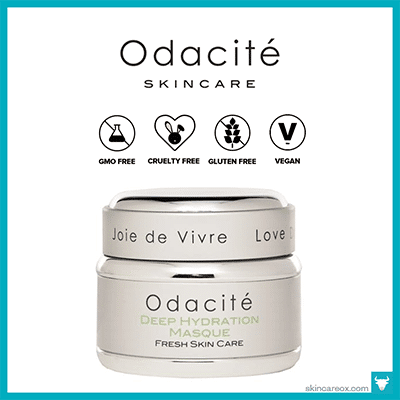 The combination of hydrating and anti-inflammatory ingredients like aloe vera (calming), prickly pear cactus (moisture binding), hyaluronic acid, and gotu kola (antioxidant-rich) will instantly reduce redness and plump the skin. If you have dry, flaky, dull looking skin, then I highly recommend using a potent aloe vera mask like this one at least once a day (preferably in the morning). It only takes 10 minutes to achieve soft and dewy skin. This organic rose petal mask is perfect for acne-prone and inflamed skin. With a healthy dose of raw manuka honey and silver hydrosol (clean colloidal silver) to kill acne-causing bacteria and rose oil, camellia oil, and turmeric extract to reduce inflammation, this mask will transform your skin. Additionally, rose oil has been known to kill acne-causing bacteria in as little as 5 minutes after application (and this mask is packed with rose oil!). On top of that, it’s packed with hydrating ingredients which bind with water to keep your skin looking and feeling hydrated longer. A really yummy mask made from simple ingredients like Colorado mountain wildflower honey, coconut oil, and vanilla extract. The mask itself smells good enough to eat and goes on creamy. The oils and honey work together to deeply hydrate the skin, break down dead skin cells, and soothe irritated skin. The result is super soft & glowing skin after just 15 minutes. Works great for those with dry and mature skin, but is even a good choice for those with more sensitive skin because of it’s simple ingredients. Raw organic honey is a great treatment for problematic skin. Whether you are treating a breakout, irritated skin, dry skin, or just need a good all-around skin boost, try mixing a little honey into a DIY mask. 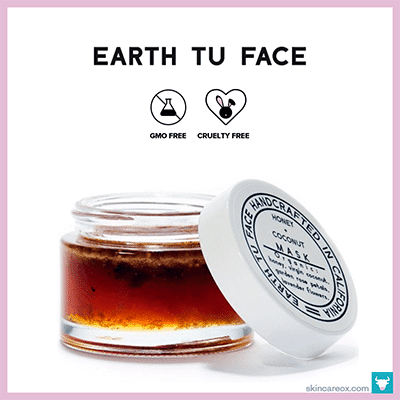 If DIY isn’t your style, Earth Tu Face already makes a heavenly honey mask so you don’t have to become a bathroom chef. In addition to the antioxidant powers of honey, this mask also includes virgin coconut oil, lavender, and rose petals which are all anti-inflammatory. 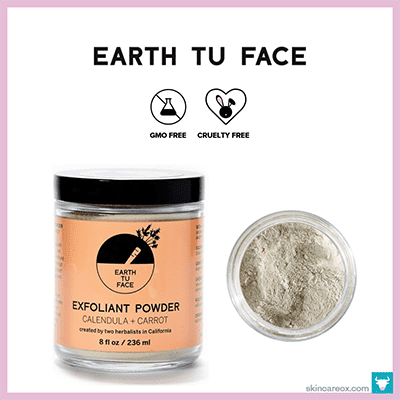 This is another great Earth Tu Face mask that is gentle enough for daily use (but it’s so nice that you may just want to save it for special occasions). The delicate area around the under eye is usually the first area of our skin to show signs of distress. Whether it’s lack of sleep or dehydration, our under eyes tell the story through puffiness, dark circles, and dryness. 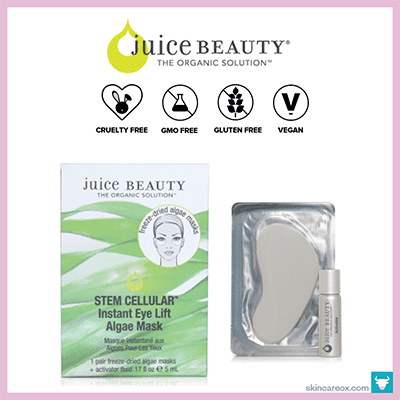 Solving these problems long-term requires good sleep and plenty of water, but in the short-term masks like Juice Beauty’s Instant Eye Lift can a huge help. 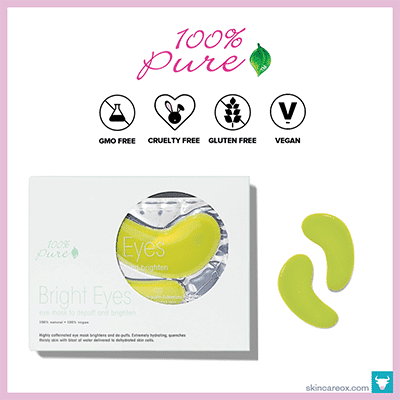 This eye mask contains delicious organic ingredients like cucumber, aloe, jojoba oil, and grapeseed oil that hydrate and moisturize the delicate eye area. Best of all, you only need to use it a few days per week to experience the benefits. 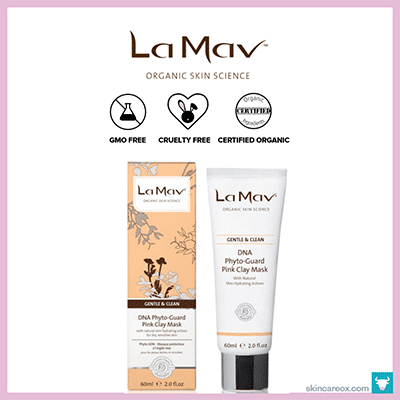 La Mav is one of the oldest and largest certified organic skin care lines in the world and their collection of gentle products are ideal for sensitive skin types. This anti-aging mask offers a 3-in-1 solution for those with dry, sensitive, and aging skin because it’s boasts cleansing, exfoliating, and skin rejuvenating properties. For sensitive and dry skin types, ingredients like pink clay, sea buckthorn, moringa extract, and acai oil work to calm and restore your skins suppleness. Mature skin types will benefit from the unique blend of flavonoids (protect and repair skin cells) which can diminish the visible signs of aging. A truly revitalizing sheet mask for those with mature skin. Ginseng is the star ingredient in this mask–and for good reason. Ginseng has a ton of anti-aging properties and compounds which can nourish and firm the skin. One of the keys to managing mature skin is to ensure that your skin gets a ton of moisture. Not only does this mask contain a good amount of hyaluronic acid for moisture, but it is also made from an aloe water + plant cellulose hydrogel base. This base slowly dissolves into the skin the longer you wear the mask. To apply, simply remove the mask from the tray and apply to your face as you lay back (the mask can slip off). 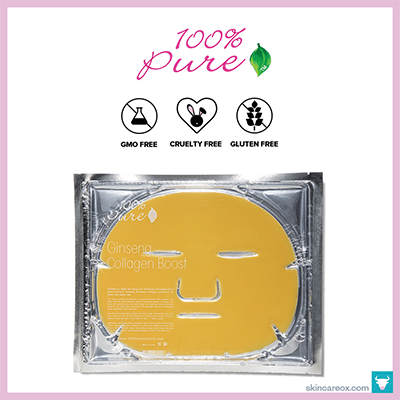 A deeply purifying and antioxidant packed mask made from a variety of certified organic and wildcrafted ingredients. This mask is really unlike anything you’ve seen before. Made with chlorella, spirulina, and matcha green tea, this mask will do wonders for clearing your pores, detoxifying your skin, and increasing circulation. The tourmaline crystals actually help the ingredients to penetrate. To use, mix a little water (or try rose water + honey) and mix until it forms a nice consistency. After just 20 minutes of use, your skin will be noticeably brighter + smoother with a lovely dewy glow. Certified by NATRUE, Amala products are guaranteed to contain only the most potent organic and wild-crafted ingredients available—and this organic yogurt mask is no exception. 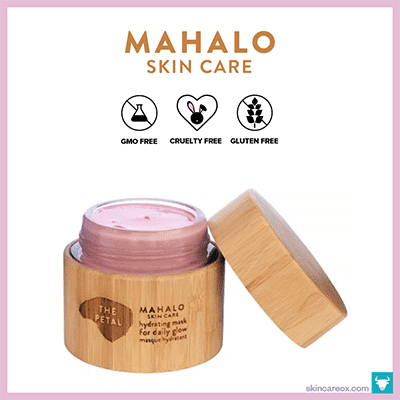 It contains organic oils and extracts like almond oil, rosehip seed oil, olive oil, orange peel oil, and sandalwood that work to soften dry skin as well as protect against moisture loss and environmental damage. This mask has a creamy silk-like consistency and it absorbs effortlessly into the skin. This mask can be worn two ways: as a 10 minute treatment or as an overnight cream. 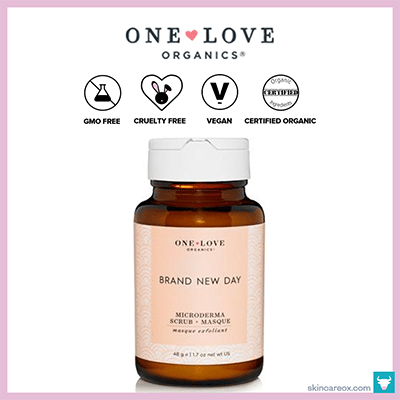 Fans of One Love Organics absolutely love this unique exfoliant + mask combo product. As a scrub, this superfine powder gently exfoliates away dead skin cells and impurities with pineapple enzymes, kaolin clay, and sweet pea flour. 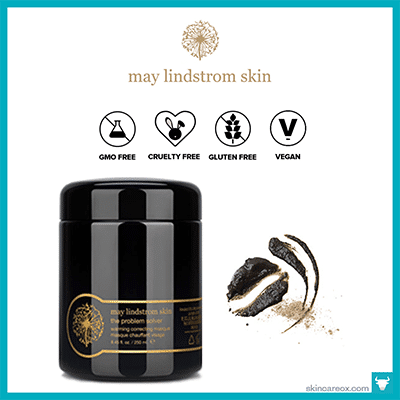 It’s a superfine powder, so it’s not as rough as traditional exfoliators (great for sensitive skin). Instead, it uses potent enzymes which are way more effective at removing dead skin than harsh abrasives. As a masking treatment, simply mix this powder with your favorite add-in (like raw honey, Greek yogurt, apple cider vinegar, green tea, etc.) and leave on for 15 minutes. whether you use this as a mask or scrub, your skin will be left dewy, glowing, and radiant. 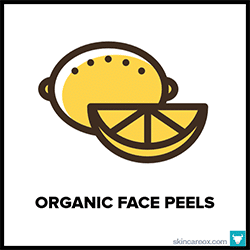 THE BEST ORGANIC FACE PEELS AND WHY THEY WORKAll about organic face peels and a list of top peels products. 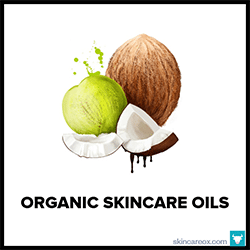 TOP 20 ORGANIC SKIN CARE OILS FOR PERFECT SKIN 2017This list contains 20 of the most effective organic skin care oils available today. 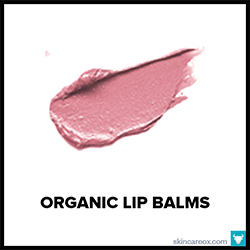 THE BIG BOOK OF BOMB (ORGANIC) LIP BALMSThis list contains the top 60 delicious certified organic, SPF, tinted, vegan, flavored, and unflavored organic lip balms. 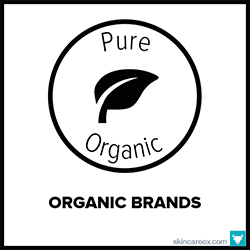 BEST ORGANIC SKIN CARE LINES OF 2017: THE ULTIMATE LISTA sortable list of 69 of the world's best organic skin care lines. At Skincare Ox, our mission is to simplify the world of skin care by creating informative, high quality skin care guides, product reviews, and advice articles. We provide practical beauty tips and tricks backed by reputable scientific studies and real results. Founded 2016 in Manitou Springs, Colorado. Get the latest skin care guides, articles, & coupon codes first. MEDICAL DISCLAIMER: This content is strictly the opinion of the writers of Skincare Ox and is for informational and educational purposes only. It is not intended to act as medical advice or to substitute medical advice or adequate treatment from a qualified medical professional. All viewers of this content are advised to consult a qualified medical professional (such as a dermatologist) regarding specific skin care and health questions. Skincare Ox does not take responsibility for possible health consequences of any person or persons reading or following the information in this educational content.